Marta Maretich was born in Port Harcourt, Nigeria and grew up in Bakersfield, California. Her mother was primary school teacher and her father was an oilman. She attended the University of California at Berkeley where she graduated with an honors degree in Comparative Literature. After graduation, she traveled extensively and worked as an English teacher in Spain, Taiwan and central Los Angeles before taking a job in publishing with the professional publisher Jossey-Bass. While there, she helped develop the first-ever imprint dedicated to the nonprofit sector. At the same time she completed an MFA in fiction from the Warren Wilson Program for Writers. Both experiences went on to shape her professional and creative careers for the rest of her life. Marta is the author of two novels: The Possiblity of Lions and The Merchants of Light. Her short fiction, poems and essays have appeared in many publications including Boom! A Journal of California, The Harvard Review and The Jacaranda Review. She was the editor of The Berkeley Poetry Review and Whispering Campaign, an arts journal. She has been awarded residencies at the Eastern Frontiers Foundation and Yaddo. Marta has written and edited numerous publications for and about the nonprofit sector with an emphasis on organizational development, leadership and governance. She currently writes about social finance and tracks the evolution of innovative approaches to funding social and environmental good. Marta has lived in London since 1995. Her husband, Michael Alford, is a painter. They have one daughter. 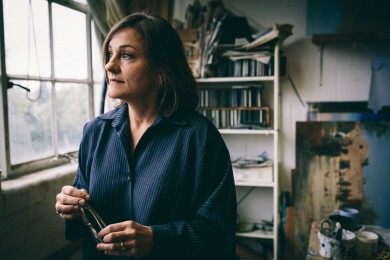 Read Marta’s in-depth interview here with writer and publisher Jo Swinnerton, as they discuss The Merchants of Light, writing and being a modern-day artist’s model.